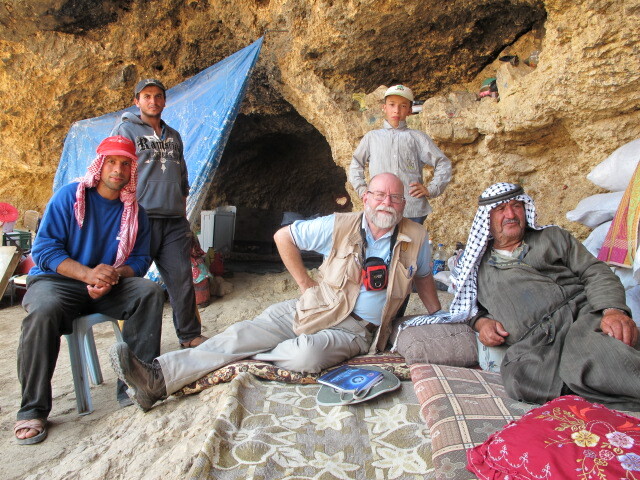 On Thursday, the 12th, we went to visit the people in Khirbet Tana. Like every day this week, it was very, very hot, and parched; and very, very dry with very little air moving at mid-day. It brought to mind bits I’ve learned about Death Valley. As the sparrow flies, it’s only 3.75 km straight east from Yanoun, where I’m staying, to Khirbet Tana. We should be neighbouring villages. We used to be neighbouring villages. Now, it is, as the Irish say, “You can’t get there from here!” Between the big hills, and the network of Israeli settlements, we first had to go south to Aqraba, west to Za’tara, north to Huwwarra and then northeast and then south east to Beit Furik, where we met with the mayor of Beit Furik. Then it was a dirt track road 8 km to Khirbet Tana. Khirbet Tana actually has much in common with our little village of Yanoun: Both are under threat from settlers and settlements. 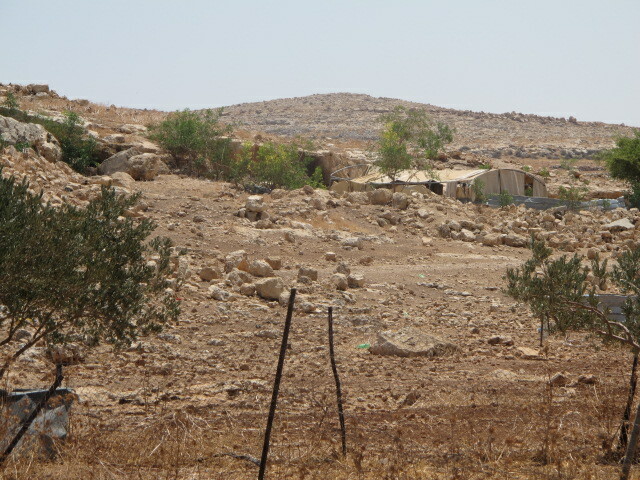 It is actually on the other side of the Itamar settlement and outposts which that harass Yanoun from time to time. 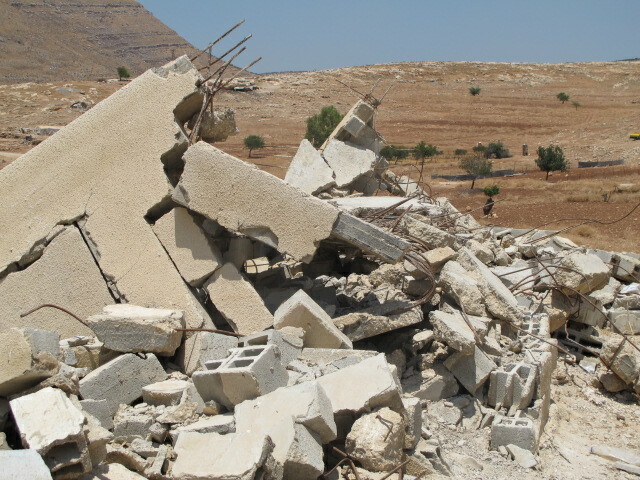 And, in Khirbet Tana, the Israeli military plays its part in the transfer of land from long-term residents to “military use” and then quickly on to settlement construction. 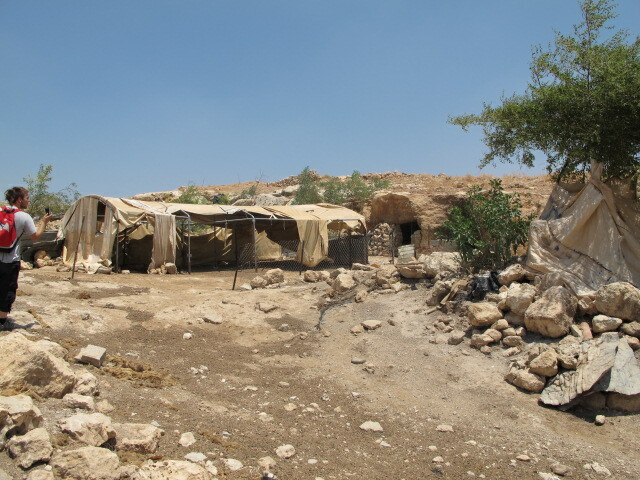 Kirbet Tana remains home to a number of families who also summer in Beit Furik. They summer in Beit Furik because, calling to mind Cole Porter’s song, “it’s too darn hot.” But not everyone summers in Beit Furik. There were families and individuals there, “holding the fort,” because if they abandon their land, even for a brief time, the settlers will take it over. 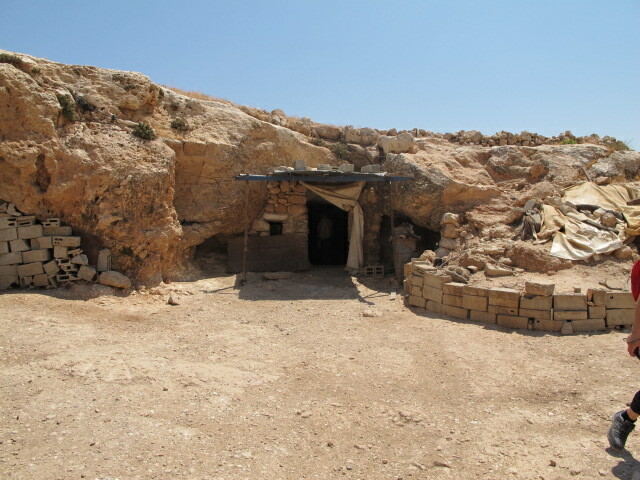 Many of their homes are caves. Seemingly superior structures have been demolished over the last few years since 2005 by the military. This impacted 35 families. The rubble is still visible to visitors. One collection of rubble was all that was left of the home of an 80 year-old woman! 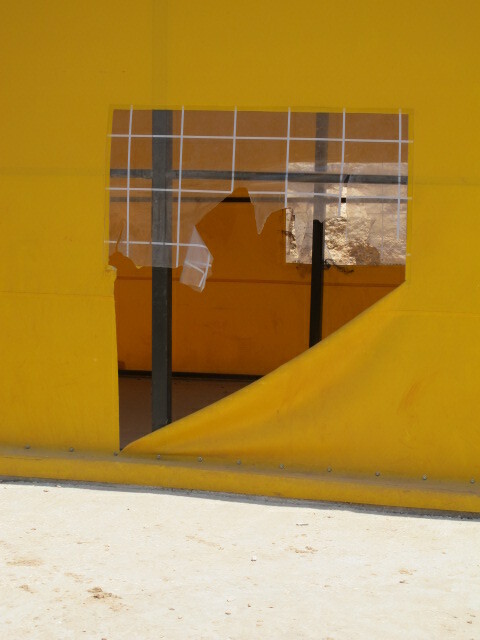 The school was also demolished, next to the mosque. But the mosque, for some reason, maybe because it was 200 years old, was spared. 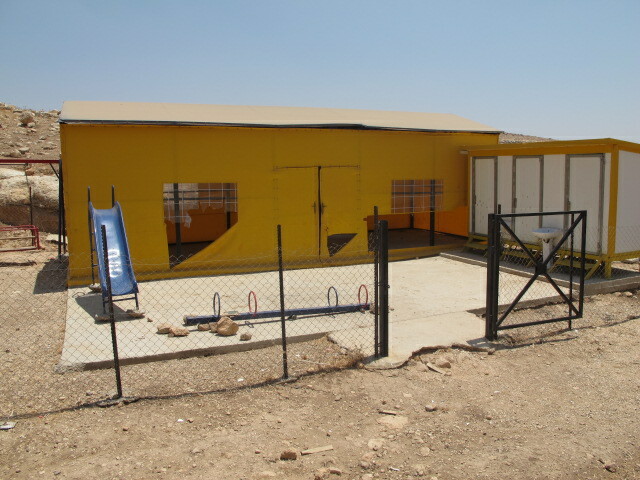 They have a relatively new school, that already needs repair. They can only repair it in a way that leaves its exterior the same. 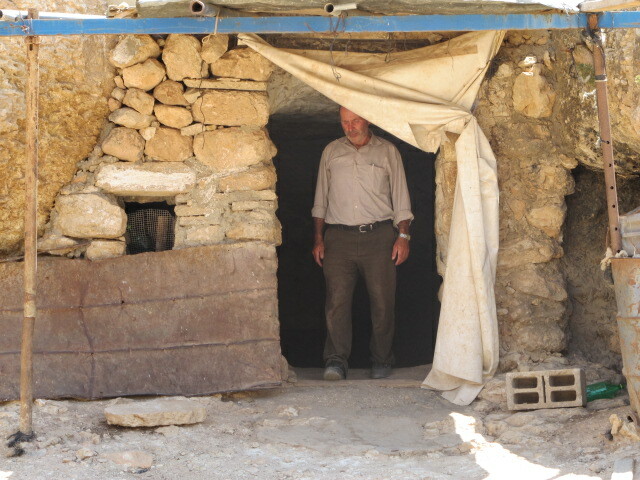 The local people told us that lately, with almost nothing left to demolish, the military tried closing-in or burying the ancient cave homes. 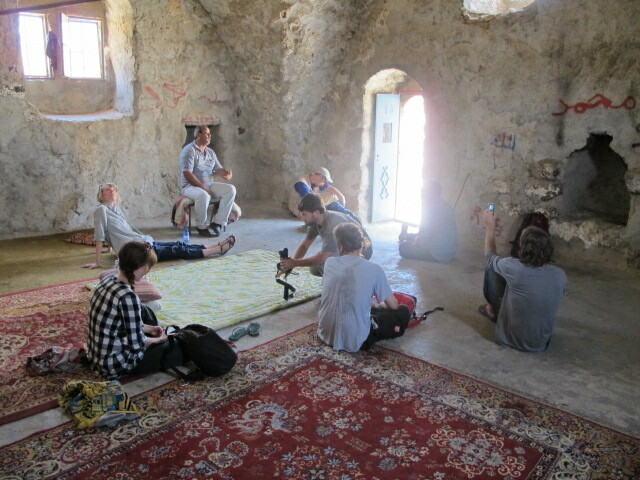 They also tried to destroy the ceilings from the caves. 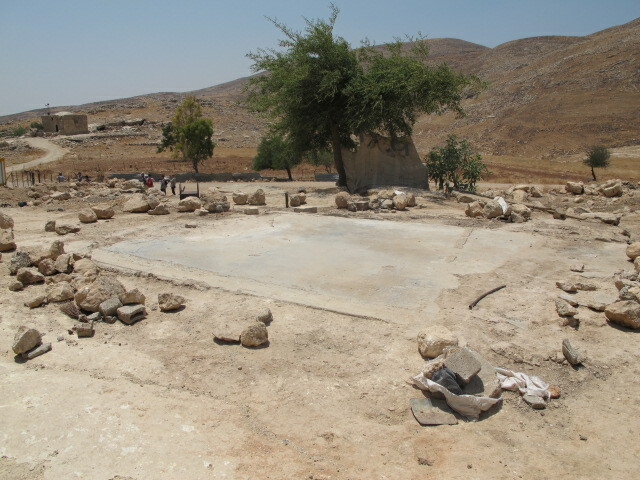 Khirbet Tana enjoys a spring, high up a hill, on the far side of the decentralized village. It is water for drinking, cooking, and watering their flocks. Lately settlers and soldiers come and swim in the cistern at the spring, temporarily polluting their prime water source. It appears to be part of the strategy to drive them off their land.. So, why is such a parched piece of paradise so coveted? The settlers have their eye on the land and on the farmers there all the time — because Khirbet Tana stands in the way of completing a network of settlements and roads for settlers, stretching from Qalqiliya — on the infamous Green Line (the original demarcation line from the 1949 Armistice Agreements between Israel, Egypt, Lebanon and Syria after the 1948 Arab-Israeli War) only 14 km from the Mediterranean Sea — through to Jordan Valley. 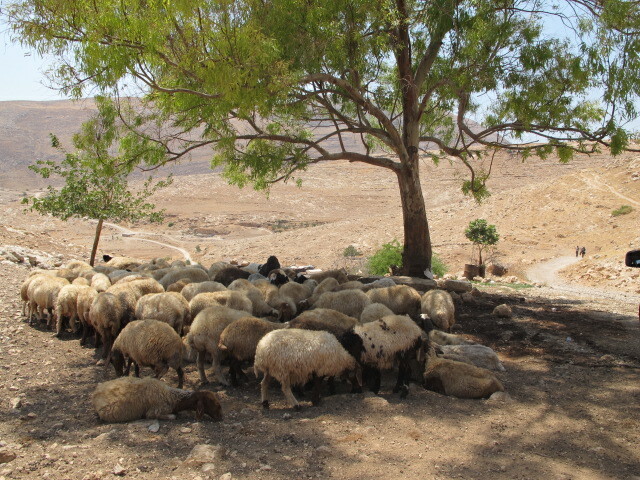 The Jordan Valley is coveted land for israel as it is the fruit basket/bread basket of the West Bank. This crooked finger of settlements extending deep into the West Bank is one of several such “fingers” penetrating the West bank and heading down into the coveted Jordan valley. Right now, many families are being driven from the Jordan valley so it can be military use land or military firing range. But, that is the prelude to settlemenst, rather than some bona fide military activity. 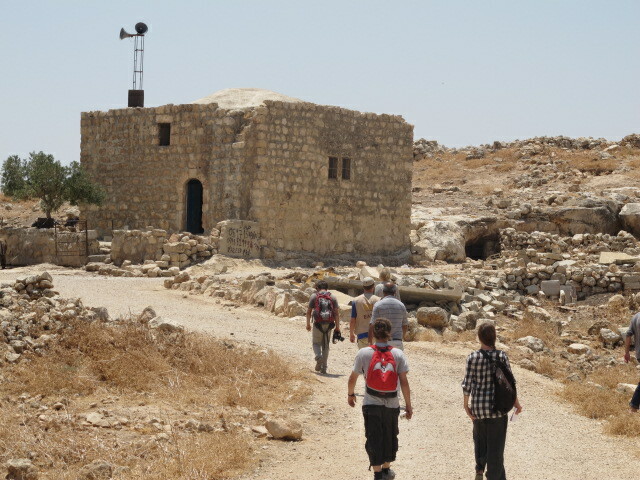 Our visit to Khirbet Tana further rounds out my education about the issue or question of settlements. Very, very naively — and I thought I was up to speed — when I first came to Palestine in November 2010, I thought the issue or settlements in the West Bank was largely a thorny border issue to be hammered out in any peaceful negotiations over a two state solution for Isreal and Palestine. Boy was I wrong! It’s way past being a border issue, or a security issue. 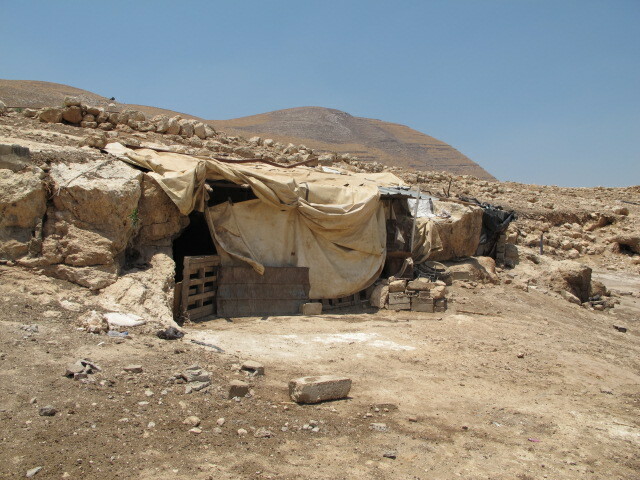 There are dozens of settlements and settlement outposts deep, deep into the West Bank. United Nations color-coded maps have been very helpful in seeing that there are several fingers — more than a handful — of settlement networks reaching far into the West Bank and on to the edge of the Jordan Valley. It appears to be a blatant land grab! The goal is to close the gaps. Some say it turns Palestine into Swiss cheese. It’s more like a Dagwood sandwich — with some layers Israel and some layers Palestine! The Palestinians we talk with, keep reminding us internationals that the years of the Oslo Peace process was for them “a second occupation.” There was no halt in settlements, despite official promises to the contrary. In fact, there was an acceleration. And to this day, the settlements keep spreading their tentacles from hilltop to hilltop. And God forbid that anyone gets in their way, neither man, woman or nation state. They are a tenacious lot. Determined! They love their ancestral lands and living on the land in this traditional manner. They have a saying: Existence is resistance. This is a hot and a thin place. 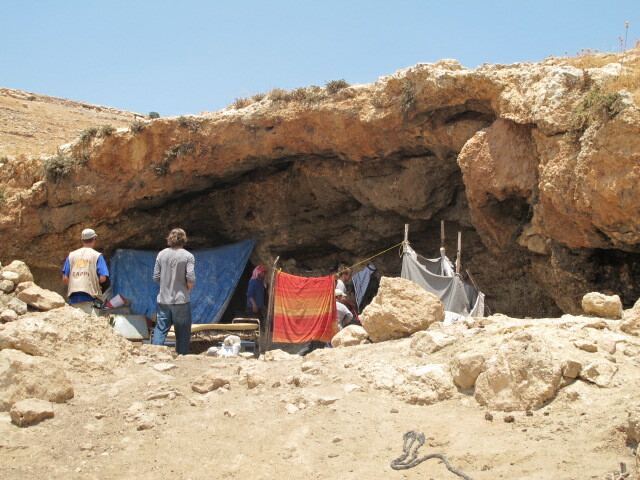 I have experienced amazing hospitality and seen “water from a rock” — way up the hillside, near the crest of the hill. It sustains and refreshes flocks, herds, and the people on the land. 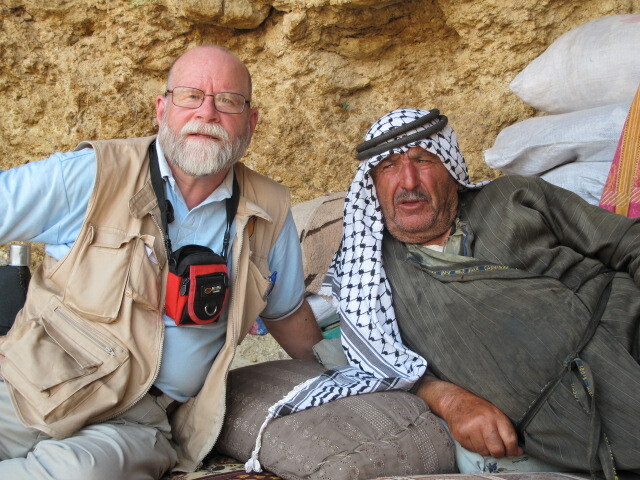 I have been sent by the United Church of Canada to participate in the World Council of Churches (WCC) Ecumenical Accompaniment Programme in Palestine and Israel (EAPPI). Should you wish to re-post, or to publicize any of this content, I welcome your direct requests, via the comments section in this blog. Thank you!